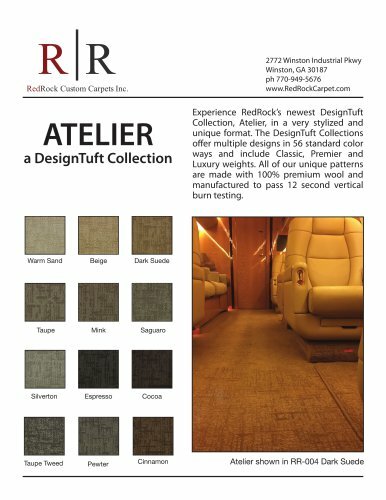 2772 Winston Industrial Pkwy Winston, GA30187 ph 770-949-5676 www.RedRockCarpet.com Experience RedRock's newest DesignTuft Collection, Atelier, in a very stylized and unique format. The DesignTuft Collections offer multiple designs in 56 standard color ways and include Classic, Premier and Luxury weights. All of our unique patterns are made with 100% premium wool and manufactured to pass 12 second vertical burn testing.